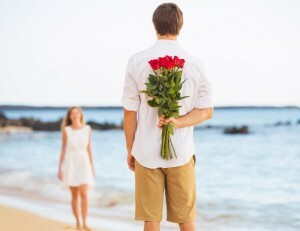 When done right, Valentine’s Day can be the most romantic day of the year. 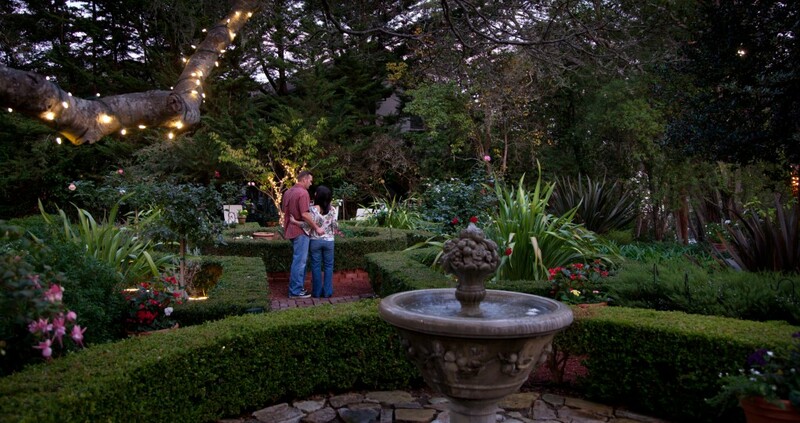 Here at the Old Monterey Inn, we are helping you do Valentine’s Day right! Our Inn is nestled amid more than an acre of beautiful gardens, and each room boasts its own private fireplace—some rooms even have a two-person Jacuzzi tub! Perfect for cuddling up, relaxing, and enjoying a moment away with your Valentine! 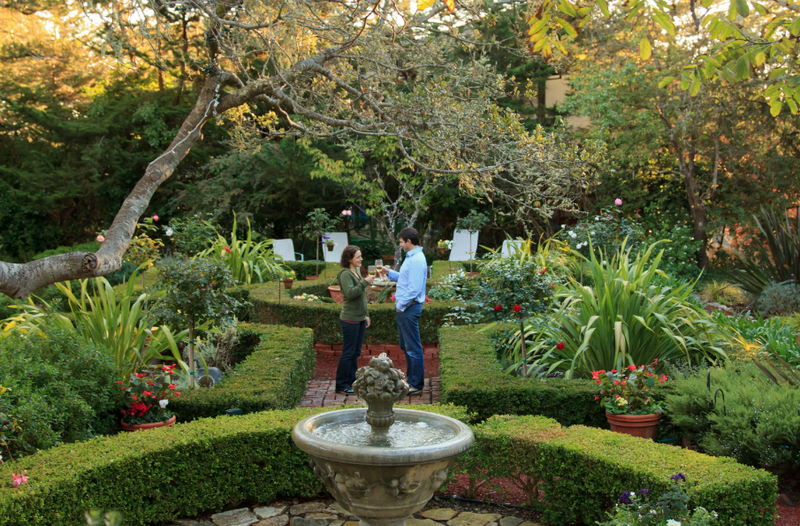 Your stay at our romantic Monterey Bed and Breakfast will start with wine and hors d’oeuvres, served from 4-6 pm, a tour of our award-winning property, and then some quiet moments with each other. Let us know ahead of time and we can have a bouquet of flowers, champagne, and chocolates in your room upon arrival! 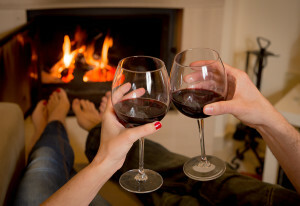 As the sun sets on the Monterey Peninsula, you can curl up together in front of your own private fireplace and sip on a glass of port before heading out to enjoy a meal. Let us know what type of food and ambiance you would like, and we will make suggestions and take care of reservations for you. We’ll even give you a card with directions to the restaurant of your choice. Let us handle the logistics so that you can share a relaxing and romantic stay with your Valentine! In the morning, our two-course gourmet breakfast can be enjoyed in our dining room, or can be delivered to your room. 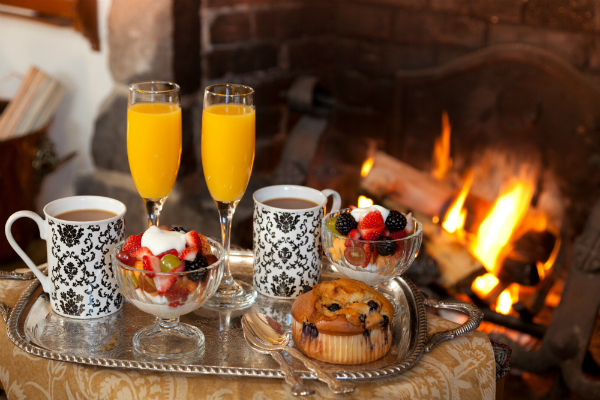 Curl up in front of your own private fireplace and enjoy a delicious breakfast brought right to your room! Once you’ve enjoyed breakfast, you can stroll around our lush, beautiful gardens and can even get a relaxing couples’ massage in our on-site spa. Let us know what massage treatments you desire, and we’ll make all of the arrangements for you—just be in your room in the robe and slippers we provide for our guests, and our massage therapists will find you. 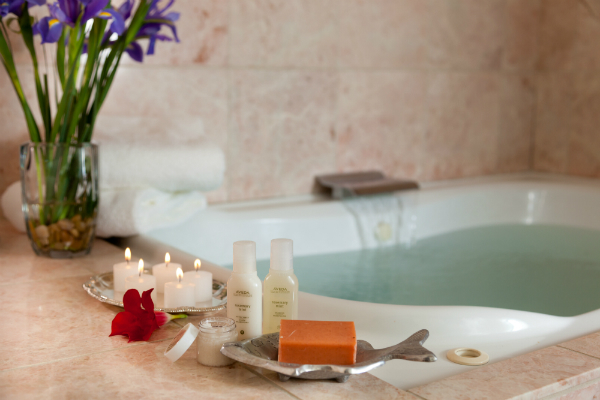 It’s sure to be a relaxing and romantic day—just what Valentine’s Day should be! If you’re joining us for a two night getaway, you might like to venture out onto the Monterey Peninsula on the second day. Ask one of our expert concierges to propose an itinerary for you and make sure that it meets all of your expectations. Here are some of the things that we think are particularly delightful: a wine trolley that visits many different vineyards and comes with a box lunch, a whale-watching trip to enjoy the natural beauty of the Monterey Peninsula, kayaking in the calm waters of Elkhorn Slough, driving along the 17-mile-drive, hiking in Point Lobos and down through Big Sur, exploring the historic adobes of Old Town Monterey, and wandering along Carmel Beach. The list goes on, but what’s most important is that it fulfills all of your Valentine’s Day dreams! Describe for us the type of day you’re looking for, and we’ll take care of the details! We look forward to welcoming you to the Old Monterey Inn and helping you do Valentine’s Day in Monterey right so that it is the perfect romantic getaway for you and your Valentine. 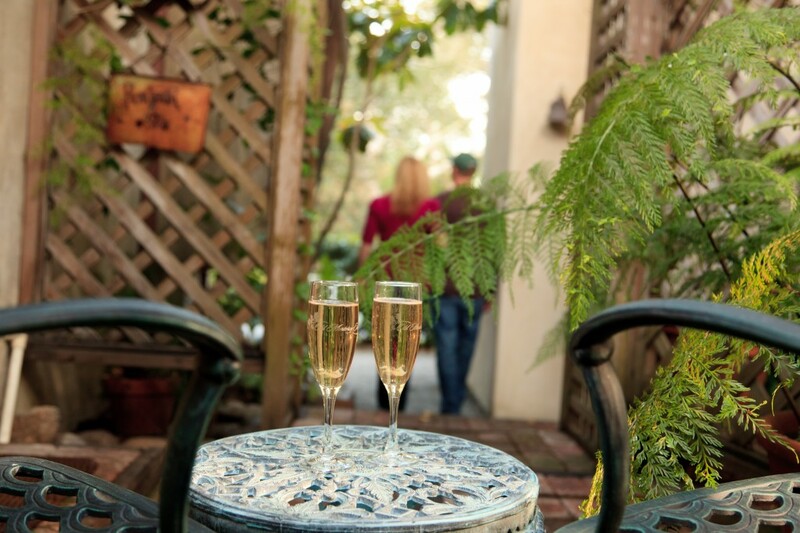 Romance and Christmas Magic Found at our Monterey Bed and Breakfast! 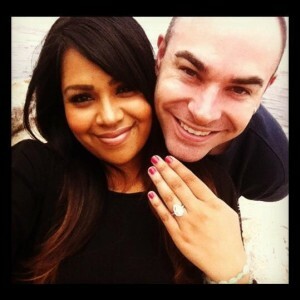 A few months ago we at the Old Monterey Inn posted a blog about the cutest couple who had just gotten engaged at our romantic Monterey Bed and Breakfast. This past week, we were honored to have them return to enjoy a luxurious Honeymoon in the very same room that they had gotten engaged in, the Brighstone Suite at our Monterey Bay Bed and Breakfast. The newlyweds, Mr. and Mrs. Joel and Paula Hamilton, were treated to our fabulous Ultimate Luxury Package, which includes an unforgettable limousine driven Wine Tour through the beautiful Carmel Valley, a romantic Couples Massage by firelight in our elegant Spa Room, fantastic dining packages, and more! I believe their Honeymoon Getaway was a huge success, and a memorable event for the new couple. We will certainly look forward to seeing them on an anniversary in the years to come! I also would like to thank everyone who made our “Christmas at the Inns” event such a wonderful success. Our Monterey Bed and Breakfast is beautifully decorated for the holidays, and we received innumerable compliments on the decorations, ambiance created by the elegant Christmas songs played by Mr. Michael Martinez (the celebrated pianist from the Big Sur Marathon for you runners out there! ), and of course, our freshly baked cookies! With the holiday decorations in place, and our warm fireplaces awaiting you, this is the perfect time to get away from your holiday stress, and enjoy a little pampering at the Old Monterey Inn. We are currently offering our lowest seasonal rates, and we would love to have you keep us company this winter! Please give us a call or check our website for availability. Don’t forget what a great present it would be for the people on your list to receive a Gift Certificate from the Old Monterey Inn!! We will take good care of them, we promise!! This is a follow up to my blog on January 13, 2010. I know that quite a few of you have been following my story. After being reunited with my high school sweetheart, Teddy, after all these years, we were married on Christmas Eve of 2010. Every day we wake up to laughter and go to bed smiling. As I said, the romance and everlasting love that they write about in all those mushy books is indeed alive and happening at the Old Monterey Inn. As I said, romance is a big thing at the Old Monterey Inn. At least once a week someone gets engaged here and we love to be a part of the surprise event. We are very good at keeping secrets and helping to plan special ingredients to embellish the surprise! 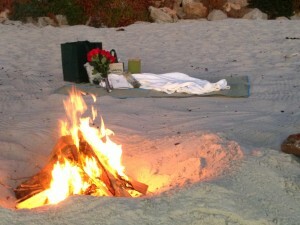 Our Beach Bonfire with the message in a bottle is an example of a unique way to propose! We also have couples celebrating anniversaries all week long. These happy couples have been returning to the Old Monterey Inn year after year (some for over 20 years) for their special day. 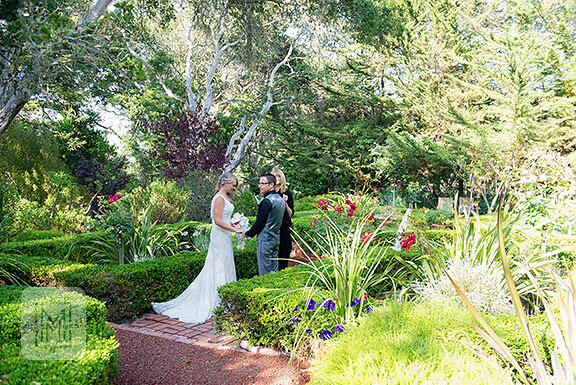 Some actually got married on the grounds of the Inn, and yes, our Monterey bed and breakfast is available for for small intimate weddings (20 people or less). So, if want some of the good vibes to rub off, come and visit us at the Old Monterey Inn, the most romantic bed and breakfast in Monterey, and the #1 rated B&B on Trip Advisor.